How was everyone`s Thanksgiving holiday? Are we all stuffed? I was and still am! I`m so proud of myself because I was able to contribute 7 side dishes for my family`s Thanksgiving dinner this year!! This may not seem big to you, however, I`m not much of a cook, so I`m happy everything turned out well! I thought this would be a great after-Thanksgiving recipe since we were stuffing ourselves silly the past few days. 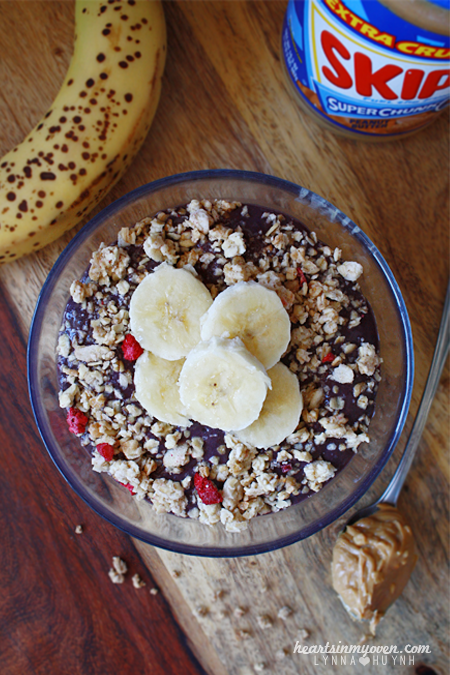 I`m not sure how popular these acai fruit bowls are you live, but they`re pretty darn popular were I am. Plus, they`re considered "healthy" by our current cultural trend (I`m still unsure of all it`s magical properties). 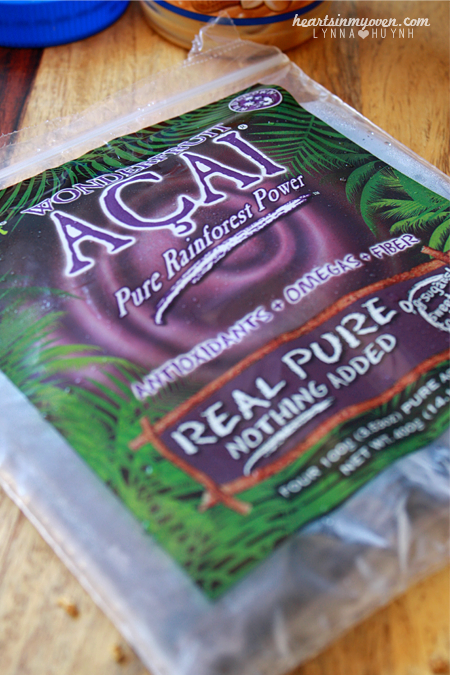 These acai bowls are basically various fruits and/vegetables blended together using frozen acai, which is this trendy "superfood". With all of these fruits, it`s bound to taste great. Plus, these are so simple to make. Personally, they`re almost like fruit smoothies, but thicker and you eat them with lots and lots of granola. (which I`m obsessed with). I`m also going to share with you a tip I learned. Freezing bananas! My parents didn`t believe me when I told them you can freeze bananas to use them up later. It`s really simple. All you have to do is freeze banana slices. 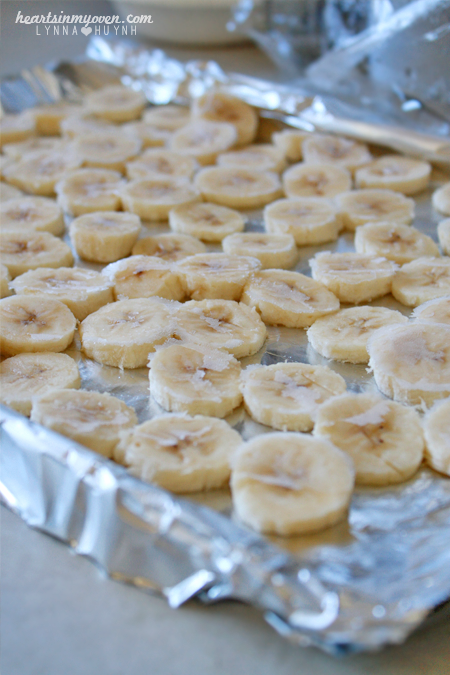 First, you cut them into slices and flash freeze them in your freezer until they`re frozen. Then, transfer them into a sealed ziplock bag. Now, whenever I need bananas in a recipe or smoothie, they`re ready for me! How convenient, right? These bowls are filling, at least for me, so I`ve definitely made these for those light lunch days. Which, I feel, is much needed, after all that heavy, Thanksgiving food! This recipe is a guideline for 1 serving and it`s really easy to adjust the recipe according to the number of bowls you want to make. I meant to share this recipe the day after Thanksgiving....but, both my sisters came back from school for the weekend and my productivity died. I`m sneaking in a post at 3am! 1. In a blender, mix together the acai, berries, 1 banana, yogurt, agave nectar, and peanut butter until smooth and combined. Scoop half into a bowl. 2. Layer with half the granola. 3. Top with the rest of the acai mixture. 4. 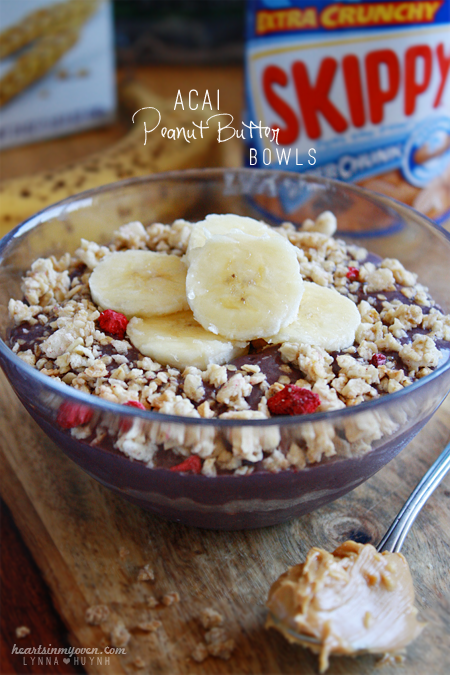 Top with granola and ½ of banana slices. You can easily double, triple, etc the recipe!